This album cover has an interesting history behind. 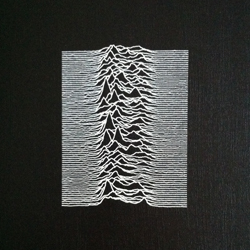 The graphic is a data display and his creator Peter Saville, describes it as a "comparative path demonstration of frequency from a signal of a pulsar. Each horizontal line, reaching a series of peaks close to the middle of the graph, is observed data from a this pulsar, and there are several of them stacked together. Saville goes on, "What you’re seeing is a comparative chart of the frequency and the accuracy of this signal."